We had every intention of heading to Salina over the weekend and checking out the Kustom Kemps of America Lead Sled Spectacular at Oakdale Park in Salina, Kan. My dad and I were going to meet up with Patrick Casey, a Colorado Springs native, family friend, and someone dad has been hanging out with since high school. The hotel room was even booked. I was going to dazzle you with a 500 photo slideshow. Unfortunately, things don’t always work out like you hope. Turns out that dad has a bad heart valve that needs to be replaced ASAP, and the doc didn’t want him trolling around one of the biggest car shows in the country in 100-plus degree heat. So I hit a couple of nice local events instead. That doesn’t mean we don’t have any coverage of the show, though. Pat still went, and sent me several pictures to share with everyone. I was also able to score some shots from Matt Smith, Jerry McElwee, and John Stamper, all hard-core hot rodders and members of the HAMB. So thanks to those guys, I still have something to write about. I still have all my dad’s old custom (Kustom) car magazines from when he was a kid, and I used to spend hours studying the pictures in those things. I love real, traditional customs, and that’s what this show is all about. Make no mistake; this show is a big deal. You tend to have a better understanding of that when you see the list of legendary custom car builders that make an appearance there. 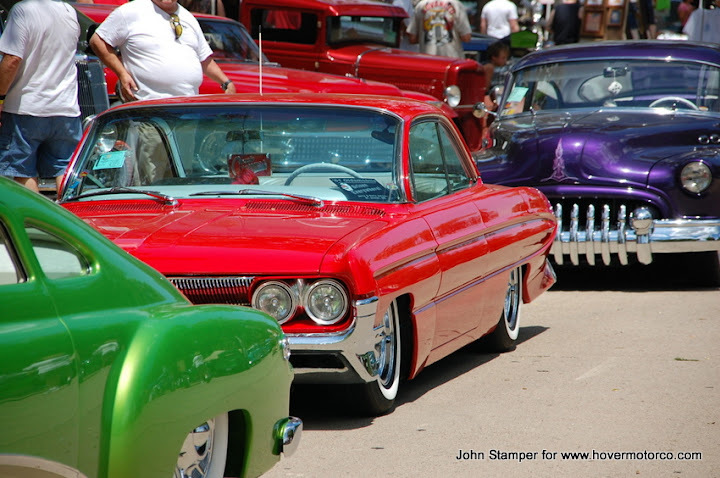 Guys like George Barris, Darryl Starbird, Gene Winfield, Mike Alexander, Bill Hines, and many others think Salina is the place to be. Old school TV and movie stars, current television coverage, and live bands are all part of the Lead Sled Spectacular experience. They even have vintage drag racing. Cars range from mild to wild. For example, Pat has a very nice ’61 Pontiac four-door hardtop that is lowered, so that would be mild. But then there’s full-on customs like the green Ford truck in the inset, and that’s undoubtedly wild. It’s hard to believe the radical modifications that some of these backyard bodymen are able to achieve. They made it look so easy in the magazines--but it was so hard to do in real life. 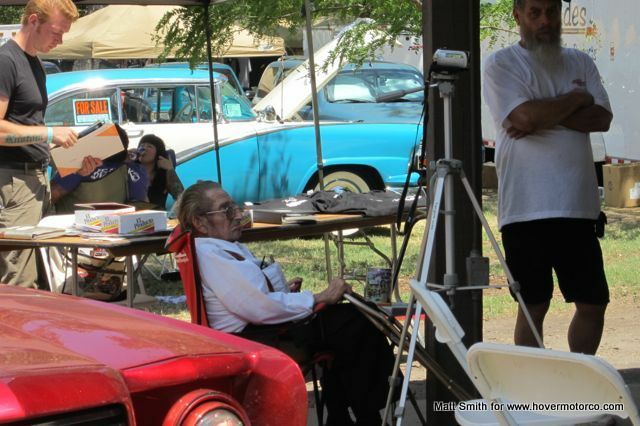 Pat seemed particularly interested in the Edsel/Ranchero combos. He asked around, and reports that Ford built 800 of them. I've never heard or read about them before, and I guess I’ll remain a little skeptical on that number until I find more proof. But it is a pretty natural-looking setup. There were three Edsel/Ranchero hybrids at this show, so apparently they’re getting pretty popular. I hope we’re able to actually attend this show in the future. But as for the present, at least we have Pat, Matt, Jerry, and John’s nice photography to hold us over. Actually, you may be better off, because my pics wouldn't have been this good. There are around 100 shots here, and I'm sure you'll like them. Check out the slideshow below. Or, click this link for a better version. Thanks for hooking us up, guys! not too old john.but i must admit its a nice ride. I dont know Mr Mayer...I drug out the photos after reading this, and I'm pretty sure that I'm getting old! Hey Craig, how is Dad doing?